Back in 1995, when the Muffs' break-through disc Blonder and Blonder was released (the one with the catchy single "Sad Tomorrow"), Muffs front woman Kim Shattuck was competing with Courtney Love for space on the planet. Rumor has it that the title Blonder and Blonder is a reference to a snarky exchange about hair color between the two pre-Donnas prima donnas. They've since made up, apparently, and Love even makes an appearance on the Muffs' latest release, Hamburger, in the form of a rambling voice mail about a stolen dress. While Love has passed into the slick, inaccessible world of super-stardom, Shattuck remains the same as she ever was -- the screaming, slightly insane girl next door. Which is not to say that either Shattuck or the Muffs have been standing still. In fact, on the band's most recent studio disc, 1999's Alert Today Alive Tomorrow, and on their current tour, the band sounds better than ever. The song-writing, focused as always on break-ups and blow-offs, is even more bristling and clever, and the tunes are increasingly complex but still percolating with power pop glee. The over-all feel of the band has grown from young punk cockiness to solid, self-assured, don't-back-down attitude. The Muffs have been around since 1991, formed by Shattuck and Melanie Vamma after the demise of their earlier band, Pandora. Ronnie Barnett and Criss Crass, on bass and drums respectively, held down the beat. Vamma departed the band in 1995, and Roy McDonald (ex of Redd Kross) replaced Crass on drums, and that line-up held stable for the next several years. 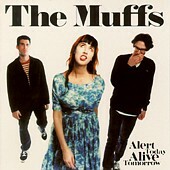 Despite personnel changes, the Muffs have managed to maintain their unique dirty power pop style. The band dwells in a diverse neighborhood where the Shangri-Las, the Divinyls, the Pixies and Sleater-Kinney all live happily together on the same street. Shattuck's trademark screaming vocals share equal time with the sweet harmonies of Brill Building girl groups, and squalling waves of feedback routinely give way to a low-fi, surfy feel. Most recently, the Muffs have been an entree on the Warped Tour menu, and they are currently peregrinating across the US and Europe in support of Hamburger, a 30-track collection of b-sides, rarities, demos and what-have-you that is an excellent sampler for people of impeccable taste who are not yet familiar with what the Muffs are about. The current incarnation of the Muffs is a slightly modified version – for the tour, McDonald has been replaced on drums by long time pal o' the band Jim Laspesa. The band's web site indicates that McDonald's departure was amicable and temporary. Live, the band. is sometimes drenched in drama, with personal feelings worn prominently on band members' sleeves. At other times, the Muffs are simply a hard working band that puts on a solid show, has a good time doing it, and wants you to have a good time, too. A recent show in Boston fell into the latter category, but before a show several years ago in the same venue, I witnessed living proof that songs like "[Hit You] Right in the Eye" come from somewhere real and genuine. I watched Shattuck smash a beer bottle against a tiled wall in the men's room during a screaming, heated conversation with Barnett, with whom Shattuck once was involved. Now ain't that what rock music's all about? Photos and artwork taken from the official site for The Muffs.